Maslow’s hierarchy of needs theory. This post describes what I found out in a non-personal way because I think this can be highly useful for companies looking to keep their employees. 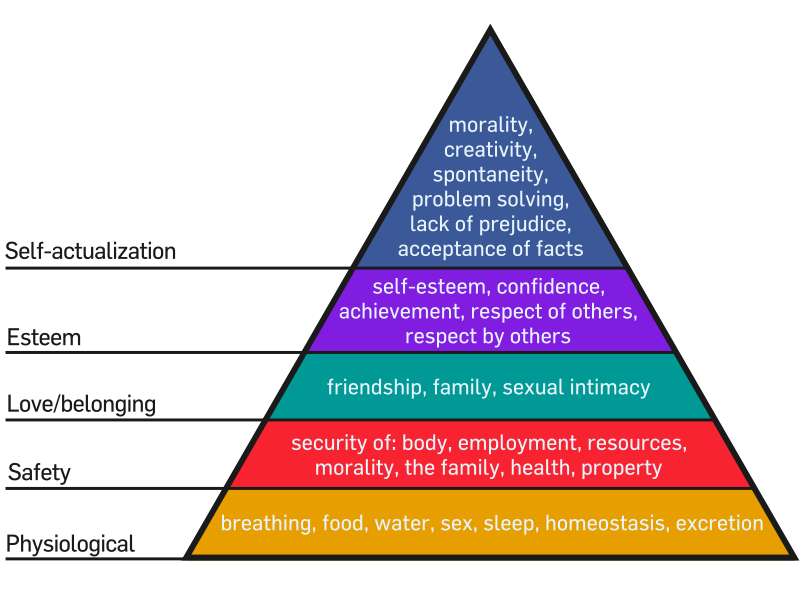 To summaries, Maslow figured out that in order to start self-actualization you would have to have some other needs met first. Once you achieve a certain level of needs to you start working on the second level striving up to Self-actualization. To the right you’ll see an illustration of the Maslow hierarchy. Notice that this is in fact an hierarchy. If someone whom had been working with Self-actualization suddenly lose a loved one, or finds him or her self in the middle of a war. It’s most likely that that person will jump down to work on Safety or Loving/belonging. Being employed affects different parts of this hierarchy. The salary might give fill you Physiological needs for food, it might even help with feeling Safe since the salary helps you put a roof over your head. You might sense belonging at work due to your work friends. Your self-esteem is affected on how good you are at your work, if you get encouragement from colleagues. You can self-actualize if allowed to grow within the company, not based on rank or title but by being allowed to grow by learning, becoming better at what you love to do. Now an employer should want one thing when hiring a someone: Does the employers self-actualization process align with the company? or in other words: Will the employee be motivated by working with this type of knowledge work? Hopefully all employee’s align in this way at the company at their respective roles. If your hiring for a great developer, is development what this person will be fulfilled by doing? Will this person be self-actualized by developing new and interesting things and learn new things from his craft? Will that person self-actualize when working creatively to solve the customers problems? The best performing knowledge workers work in the self-actualization of needs, and probably have done so for quite some time. To keep such an employee in the self-actualization part of the hierarchy is good for the company, we need to realize that the other levels in the hierarchy needs to be fulfilled first. If an employee looses a family member for some accident, then that employee will most likely start to mourn and work on the Love/belonging level of the hierarchy. So to keep an employee motivated, being informed about what’s happening to that employee and helping him or her get past that issue will get the employees motivation back on track faster. If a employees house burns down, helping that employee find a temporary home for his or her family, will make sure the employee has his or her Physiological and Safety needs met. If someone is bullied at work, making sure that person is respected and treated well at work will help that employee with Esteem and belonging needs. In essence if you have a motivation problem with one of your employees, find out what’s wrong and see how you can help him or her to full fill the level of need he or she is working on right now. Once that person is back at self-actualization, most likely motivation is no longer a problem. Caring about your knowledge workers needs and cater to the to keep them at the Self-actualization level, will have them motivated and working creatively. Or as someone said on Twitter: Tiered of coding? fix the other problem in your life and get on with it.